Today is the big day for those of you who have been anticipating some fresh new Windows 8 bits to toy with: Following an official debut right next door to the Mobile World Congress – not specifically at it, it’s a little side event at the Hotel Miramar in Barcelona – Microsoft has just officially released the Windows 8 Consumer Preview. So, what’s new in the build? Some of the more noteworthy improvements include OS-wide spell check (this is huge; it’s a feature that has been requested by a lot of people for years), the replacement of the Start button with what is called a "Start preview thumbnail" – which displays a preview of the start screen on top of an interface that allows you to cycle through all of your open apps – and the introduction of "Flyout" notifications. One thing that I found to be quite humorous is that Microsoft actually added a feature called "boot forward"; see, due to the vastly improved boot times in Windows 8, it would be tough or impossible to pull up a boot options menu (i.e by pressing F8). They actually had to implement a feature that lets you set boot options prior to restarting. I will be writing a comprehensive review of this build shortly, in which I’ll elaborate on just how nice these features are when put to use. It would appear that Microsoft finally hired a plumber to solve their constant leak issues as, surprisingly, there have been no Windows 8 build leaks during the interim period from September to now (of roughly five months). Also, little information has unofficially trickled out since; much of what we learned about the OS during that period is thanks to the notoriously long Building Windows 8 blog posts by Steven Sinofsky. 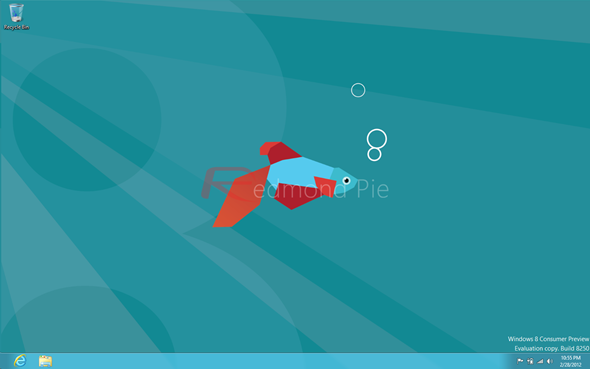 This Consumer Preview release is the first official Windows 8 build drop from Microsoft since the Developer Preview, which was released during the BUILD conference last September. This was downloaded quite rapidly, surpassing the 500,000 downloads mark within 24 hours of release, and the 3 million mark by December, so it will be interesting to see how much traction the Consumer Preview will gain. Now, at this point, we bet that you’re just bursting with anticipation to download the build, so here you go; the build can be downloaded using the links below. Simply select which architecture you’d like (the build was released in both x64 and x86 flavors, though we recommend you grab it in 64-bit if your system supports it), burn the ISO, and install the build!